Why should we think about the ocean? Perhaps because the ocean is the biggest physical feature on our planet Earth, covering approximately 70% of the planet’s surface. Most of Earth’s water (97%) is in the ocean. Even if we live far away from the ocean we are connected to it by the water cycle of evaporation and rain. Also because all major rivers, lakes and watersheds on Earth drain into it. We should think about the ocean because even though the ocean is large, it is finite and its resources are limited. 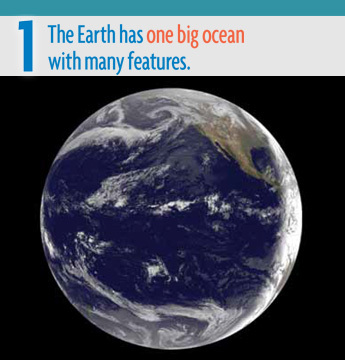 1: The Earth has one big ocean with many features. a. The ocean is the defining physical feature on our planet Earth — covering approximately 70% of the planet’s surface. There is one ocean with many ocean basins, such as the North Pacific, South Pacific, North Atlantic, South Atlantic, Indian, Southern, and Arctic. b. Ocean basins are composed of the seafloor and all of its geological features (such as islands, trenches, mid-ocean ridges, and rift valleys) and vary in size, shape and features due to the movement of Earth’s crust (lithosphere). Earth’s highest peaks, deepest valleys and flattest vast plains are all in the ocean. c. Throughout the ocean there is one interconnected circulation system powered by wind, tides, the force of the Earth’s rotation (Coriolis effect), the Sun, and water density differences. The shape of ocean basins and adjacent land masses influence the path of circulation. This “global ocean conveyor belt” moves water throughout all of the ocean basins, transporting energy (heat), matter, and organisms around the ocean. Changes in ocean circulation have a large impact on the climate and cause changes in ecosystems. f. The ocean is an integral part of the water cycle and is connected to all of the earth’s water reservoirs via evaporation and precipitation processes. g. The ocean is connected to major lakes, watersheds and waterways because all major watersheds on Earth drain to the ocean. Rivers and streams transport nutrients, salts, sediments and pollutants from watersheds to coastal estuaries and to the ocean. NERACOOS – The Northeastern Regional Association of Coastal Ocean Observing Systems collects a lot of data about our portion of the ocean. Check out their site for many cool visualizations, including forecasts of ocean waves or real-time data. News: NEwswave posts on ocean circulation , waves, and watersheds.